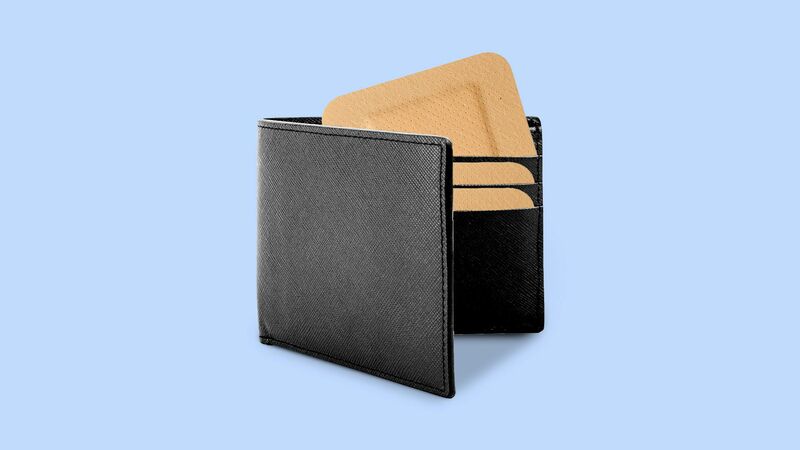 Millions of Americans lose their health insurance plans every month, by leaving the job through which they got that coverage, Axios’ Bob Herman reports. Why it matters: Critics and skeptics of “Medicare for All” worry about eliminating people’s existing coverage because most people are relatively satisfied with their employer-based plans. But millions of workers and their families already switch or lose their insurance from their jobs. 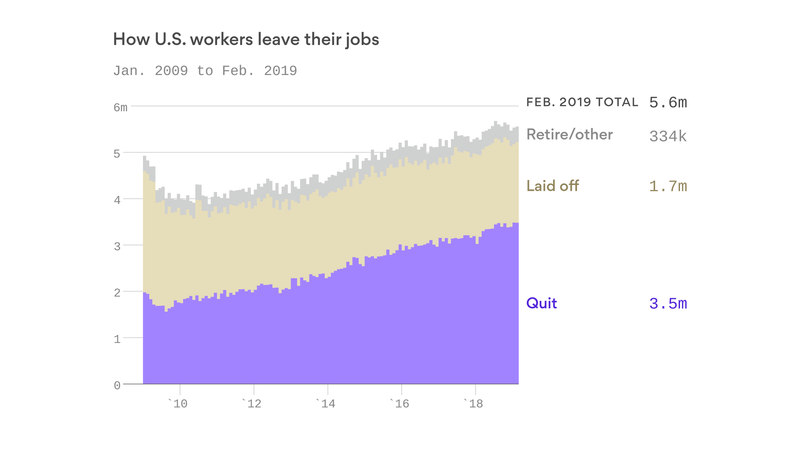 By the numbers: More than 66 million Americans voluntarily quit their jobs, were laid off or otherwise separated from their employers in 2018, and that high turnover rate has continued into 2019, according to data from the Bureau of Labor Statistics. It’s therefore reasonable to estimate that at least 2 million workers and their families lose or transfer to new commercial health plans every month. Hospitals, physicians and insurer groups are united in wanting to preserve the Affordable Care Act and have defended it in briefs filed with the Fifth Circuit Court of Appeals. The American Hospital Association, the American Medical Association and America’s Health Insurance Plans are among groups that are fighting a lower court ruling in Texas that struck down the law. On the other side is the Department of Justice, which last month reversed an earlier opinion and sided with the Texas judge who ruled that without the individual mandate, the entire ACA has no constitutional standing. The ACA has insured millions who otherwise may not have been insured, allowing them to get care when needed instead of going to the more expensive emergency room when they have a medical crisis. Hospitals and physicians see less uncompensated care under the ACA. Without the ACA, patients would no longer have protections for pre-existing conditions, children would no longer have coverage under their parents’ health insurance plan until age 26, insurers would no longer be held to the 85 percent medical loss ratio, 100 percent coverage for certain preventive services would cease and individual marketplace and subsidies based on income would be eliminated. Also, federal funding for Medicaid expansion would end. Republicans under President Trump have tried unsuccessfully to repeal and replace the law. The lawsuit, brought by 19 Republican governors, puts the GOP in a political bind over supporting the repeal of a law that is popular with consumers and their constituents. President Donald Trump recently said Republicans would unveil an ACA replacement after the 2020 election. Democrats are also facing a crisis within their party over healthcare as it becomes a priority issue in the presidential election. Some of the leading candidates, such as Senator Kamala Harris, support Medicare for all. The Medicare for All Act of 2019 has been introduced in the Democratic-led House of Representatives. Veteran politician and attorney Earl Pomeroy said he believes the Texas versus United States appeal changes the political course for 2020. The entire MFA argument will move to the back burner because of the Texas lawsuit, he said. Pomeroy is a former member of the U.S. House of Representatives for North Dakota’s at-large district, a North Dakota Insurance Commissioner and senior counsel in the health policy group with Alston & Bird. The lawsuit was brought by Texas and the 19 other Republican-led states, based on the end of the individual mandate. In February, U.S. District Court Judge Reed O’Connor agreed that the federal law cannot stand without the individual mandate because if there is no penalty for not signing up for coverage, then the rest of the law is unconstitutional. Twenty-one Democratic attorneys general appealed and the House of Representatives has intervened to defend the ACA in the case. Either outcome in the appeals court may see the case headed to the U.S. Supreme Court. In a court brief filed by the AHA, the Federation of American Hospitals, The Catholic Health Association of the United States, America’s Essential Hospitals, and the Association of American Medical Colleges urged the Fifth Circuit Court of Appeals to reject a district court decision they said would have a harmful impact on the American healthcare system. “Those without insurance coverage forgo basic medical care, making their condition more difficult to treat when they do seek care. This not only hurts patients; it has severe consequences for the hospitals that provide them care. Hospitals will bear a greater uncompensated-care burden, which will force them to reallocate limited resources and compromise their ability to provide needed services,” they said. In a separate friend-of-the-court brief, 24 state hospital associations also urged the Fifth Circuit to reverse, highlighting specific innovative programs and initiatives for more coordinated care. AHIP said the law impacts not only the individual and group markets, but also other programs such as Medicaid, Medicare and Part D coverage. The only plausible explanation for President Trump’s renewed effort through the courts to do away with the Affordable Care Act, other than muscle memory, is a desire to play to his base despite widely reported misgivings in his own administration and among Republicans in Congress. Reality check: But the Republican base has more complicated views about the ACA than the activists who show up at rallies and cheer when the president talks about repealing the law. The polling is clear: Republicans don’t like the ACA, but just like everyone else, they like its benefits and will not want to lose them. The big picture: About three quarters of Republicans still have an unfavorable view of the ACA, and seven in 10 say repealing the law is a top health priority for Congress — higher than other priorities such as dealing with prescription drug costs. And yes, 7 in 10 Republicans still want to see the Supreme Court overturn the law. 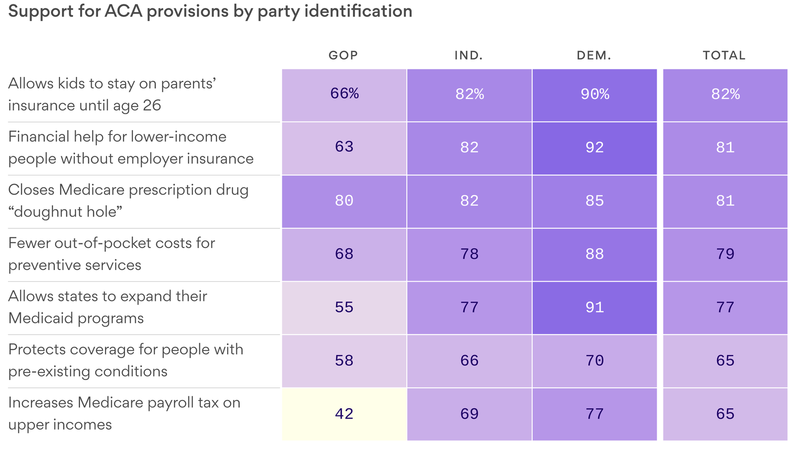 But as the chart shows, majorities of Republicans like many elements of the ACA —especially closing the “donut hole” in Medicare prescription drug coverage (80%), eliminating copayments for preventive services (68%), keeping young adults under 26 on their parents’ plans (66%) and subsidies for low and middle-income households (63%). Nearly half of Republicans want the Supreme Court to keep the protections for pre-existing conditions (49%), and even more show general support for the pre-existing conditions protections (58%). During the repeal and replace debate in 2017, even Republicans were nervous to hear that these sorts of things would go away. The 2020 campaign would drive home to the public, and to Republicans, what they have to lose — and it would become especially real to them if the 5th Circuit Court of Appeals upholds the ruling striking down the ACA. Maybe Republicans would forget about these lost benefits if they could agree on a replacement plan they liked? But there isn’t one, and many of the ideas thought to be elements of one — such as cutting and block granting both Medicaid and ACA subsidies — are non-starters with Democrats and moderate Republicans on Capitol Hill. They’re unpopular with the public, too. The bottom line: It is widely accepted that a renewed debate about repeal hands Democrats a powerful new political opportunity. Deeper in the polling, it’s also clear that’s it’s more of a mixed bag for Republicans than President Trump may realize. GOP leaders are trying their best to put a lid on President Trump’s talk of a new and wonderful health care plan that would define the Republican Party for 2020. “Not any longer,” Senate Majority Leader Mitch McConnell said yesterday when asked whether he and Trump differ on health care. RNC Chair Ronna McDaniel and Trump campaign manager Brad Parscale also “tried to tell the president they could not understand what he was doing,” The New York Times reports. Rhetorically, Trump has kicked the can past 2020, just after pushing his administration to dive back into — and escalate — the legal fight that hurt Republicans so badly in 2018. Reality check: It’s still the Justice Department’s position that the courts should strike down the Affordable Care Act. As long as this lawsuit is still active — and that will be a while — it’ll be accurate for Democrats to say on the campaign trail that Trump is trying to end protections for pre-existing conditions. In the short term, Trump’s rhetorical punt to 2021 may dampen the intensity of questions about how Republicans would rebuild a new system for individual coverage — questions the party has struggled to answer for the past 9 years. But in the end, the only good way out is for the Trump administration to lose this case. 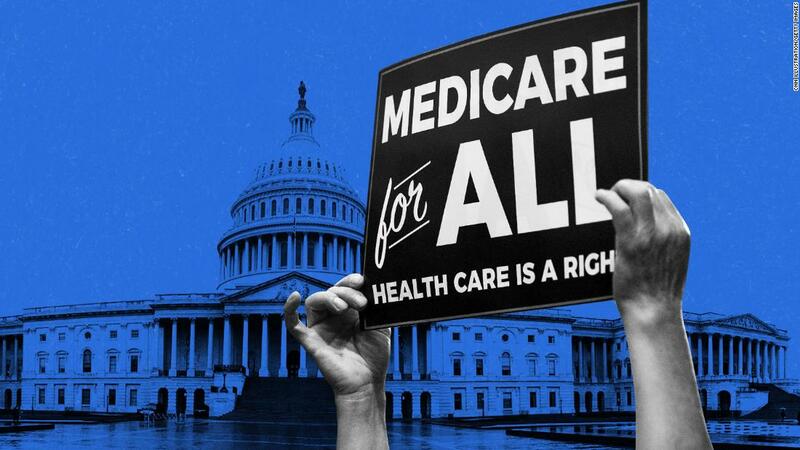 As the 2020 campaign ramps up, Democrats may be able to rally their base by talking about universal coverage and making health care a right through Medicare-for-all. Republicans may be able to motivate their core voters by branding progressive Democratic ideas as socialism. The catch: But it’s the candidates who can connect their plans and messages to voters’ worries about out of pocket costs who will reach beyond the activists in their base. And the candidates aren’t speaking to that much, at least so far. The anxiety over out of pocket costs is real. In a January 2017 Kaiser poll, 48 percent of voters worried about paying their health care bills. 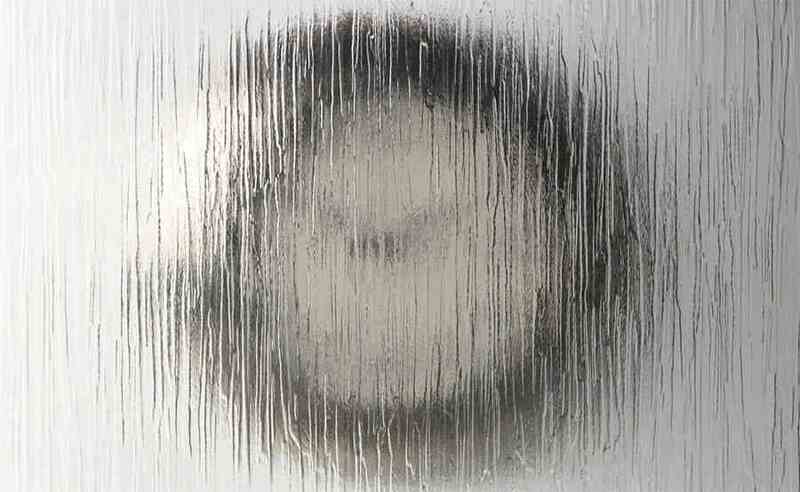 People who are sick are especially concerned, with 66 percent worried and 49 percent very worried. It isn’t just in their heads: a whopping half of people who are sick have a problem paying their medical bills over the course of a year. The health insurance system is not working for people who are sick. Thanks in part to the Affordable Care Act, only 10 percent of the population remains uncovered. But that means many Americans are less focused on getting to universal coverage, even though candidate after candidate talks about it. They have insurance and are focused on their own, often crippling health care costs. Most Americans are healthy and don’t use much care, but almost everyone, not just people with a major illness, worries about what might happen if they or a family member get cancer or heart disease or suffer a permanent injury. That’s what fuels health care as an issue: the fear of facing costs people know they cannot afford. And that’s why protections for people with pre-existing conditions broke through as a prominent issue in the midterm election. The debate and the Democratic message could shift back to the ACA again, after President Trump and the Justice Department’s surprise decision to push for throwing out the entire law in the courts. That move handed Democrats a political opportunity they will not ignore: a pre-existing conditions debate on steroids. Deductibles rose eight times faster than wages between 2008 and 2018 for the 156 million Americans who get their insurance at work. Forty three percent of all insured Americans said in 2017 that it was difficult to pay their medical bills before their deductible kicked in, up from 34 percent just two years before. Some of the administration’s policies are exacerbating the problem, such as their efforts to push cheaper short term insurance plans for the healthy, which drive up costs for the sick because they leave fewer healthy people in the regular insurance plans to help pay for sick people’s costs. Several of the candidates’ plans address out of pocket costs, including the Bernie Sanders plan, which eliminates them. Their advocates just don’t talk about it much. The bottom line: It’s hard to see the new debate about the health system breaking out of familiar boxes unless the messaging changes. And when the general election comes, both parties will have to convince voters that they will do something about out of pocket costs if they want to reach beyond core base voters.